The arrival of Spring is a joyous time for us all: blooming flowers, heaps of sunshine and an overpowering compulsion to dig out all of the easter nails pastel nail polish we own. 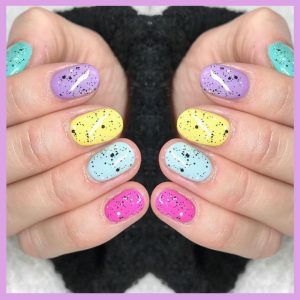 When Easter comes along, Pinterest and Instagram are booming with seasonal hints and tips from beauty and nail fanatics – from speckled mini eggs to eye-catching pastel gradient French tips, we’ve rounded up 2 of best, wearable easter nails manicure ideas from a select few of our favourite Instagram nail heroes. A firm chocolate favourite of ours, mini eggs, are replicated beautifully in this speckled nail art by @beautyworksbyamy. Mimicking the chocolate eggs and their pastel palette, this easter nails designs is perfect to rock throughout Easter, and after the chocolate craze is over. While these delicious nails aren’t edible, they will definitely have us dreaming about when we can finally get our hands on our easter eggs. If you want to amp up the glam this Easter, replace the brown specks for a metallic gold. Now that’s a boujee easter egg if we’ve ever seen one. Begin by painting each nail with a pastel nail polish. Using a light brown nail polish, paint a light layer across a stippling brush and then lightly press the brush across the nails. To clean everything up, use a Q-tip and nail polish remover to wipe off any excess polish on your skin. Apply a coat of matte nail polish to create a dusty mini egg effect. Although baby chicks and cartoon bunnies may seem like the appropriate nail wear this holiday, they won’t be appropriate for running errands or going out on the town once Easter is over. 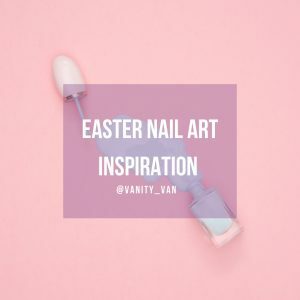 If you want a long-wearing easter nails that you’ll be able to rock once the Easter festivities are over, this minimalist approach to Easter nail art is a great go-to. 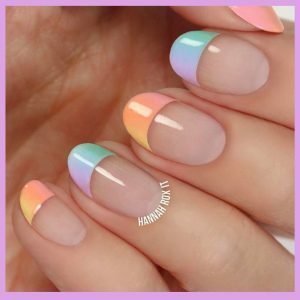 We’re taking it back to basics with this pastel gradient French tip nail design by @hannahroxit as it’s incredibly easy for beginners to perfect, yet it screams “I just left the nail salon”. You can choose to go with a monochromatic gradient look, or you can create a swoon-worthy colour melt effect by incorporating different colours. Using the a white nail polish, paint the tips of your nails and and form a draft for the french tip. Place a piece of scotch tape across the nail, as close to the white polish as possible. Grab your sponge and paint three stripes of pastel colours in the order you desire onto the sponge. Let the polishes overlap a little to allow the colours to melt together. Slowly roll the sponge over the tip of the nail to apply the colours. If you want your gradient look to be more intense, let your nails dry and apply a second coat to each nail. Remove the tape and, using a fine nail art brush, carefully sculpt the french tip and clean up any excess polish on the skin. Apply a generous coat of top coat to your final look to protect your nails and give it a glossy, shiny finish. What design will you be gracing your nails with this Easter?